Latest Leclaire Lunacy -- Wonder Twin Powers -- Activate! 1. Releasing the angels of abundant harvest -- this was the start of 2017 prophecy to make everyone feel good and think that it would be nothing but puppies and rainbows for the upcoming year. Apparently Jennifer had these angels stored away in a barn somewhere and now it was time to release them! This was alleged by Jennifer to be an urgent word from the Lord but she made everyone wait for her new book about these fake angels so she could make some coin from it. 2. Creating new and innovative ways of robbing the people of God -- this year saw Jennifer launch her very own School of Prophets, conveniently located at a room in the Holiday Inn by the Fort Lauderdale Airport. For a meager $300 you can learn something the Bible makes clear is only given by the Holy Spirit! Jennifer would not just leave you with the 10 cent certificate for completing her school however. Realizing that up and coming false prophets need street cred, she also now offers for you to join her prophetic "covering" for only another $300. 3. The Calamari Threat - in what has to be one of the more bizarre moments in the spotty history of Charismania, Leclaire claimed that God showed her a sneaky squid spirit resting upon a friends head. She of course rushed into action and bound or rebuked, or did something realllly spiritualish to defeat this deadly spiritual warfare enemy that the Bible mentions no less than zero times. The prophets reward for her heroic and selfless act? That ole sneaky squid started stalking her! Two intercessors and a restraining order later, and Leclaire was free from the shifty cephalopod. Hallelujah! Pass the offering plate! 4. The prophetic word for the body of Christ for the month of May was released as: "Mega grace and mega faith equals a mega movement." Despite being mega-unbiblical, Leclaire marched on with unflinching mega-foolishness. All in the name of God. Claiming that God said all of these ridiculous, unbiblical, inane things. Beloved I make no personal assessment of Jennifer Leclaire. It is her teachings and alleged prophecies that are absurd; bordering on the incoherent. It is things like this that give Charismania the well-deserved black eye it currently sports. There remains a firm possibility that Leclaire has just been so poorly taught that she believes this nonsense. That she cannot discern between the angels she writes so much about and the demons surrounding her masquerading as angels of light. The fact that she makes money from her falseness is a pretty damning factor but she may very well be deceived, deceiving others. It matters not because it is the sheep that must be protected from the wolves, whether they are intentional or accidental wolves. This brings us to the latest scheme from Leclaire. She has written yet another book about a topic she knows dangerously little about -- angels. Not content with releasing those pesky angels of abundant harvest that seemed to have skipped my house, she now has written, "Angels on Assignment: Warrior Angels Activating Now." In order to promote this book, Leclaire took it to the Jim Bakker Show because after all, nothing smells more credible than appearing on the show hosted by a disgraced former tele-evangelist turned prepper food bucket salesman. With every bulk order of her new book I believe Jim was releasing a small bucket of his doomsday scenario food. Leclaire states on the show that not only are angels among us but we have to activate them in Jesus name! Who knew? 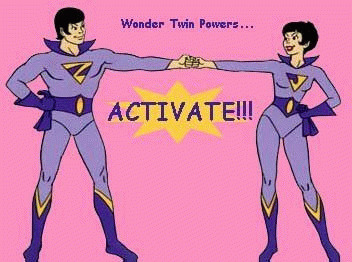 Those of us who grew up a few decades ago will remember the superhero cartoon called the Wonder Twins. The extraterrestrials from the planet Exxor had magic rings that when they connected them allowed them to change their form but it only worked with the magic phrase -- wonder twin powers activate! I bring this up not only because of the connection to what Jennifer is now claiming but to highlight that the wonder twins cartoon was probably more biblical than this latest lunacy from Leclaire. By "getting a lot of spiritual warfare"; Jennifer is referring to people who dare to doubt her direct revelations from God. Just to be clear however, I am declaring no such word curses because her words are the curse. According to the Bible if anyone presents a different gospel let them be accursed. Once Jennifer claims these things as prophecy, she is claiming God spoke them and thus they are elevated to the level of Scripture. In Jennifer's gospel there are squids and abundant harvest angels and mega movements but these are nowhere in the true Gospel. The media campaign for the release of her new book will continue at a conference she is organizing named for her book. She will act pious in pointing out that the three day event is free but I wonder how many "love offerings" will find their way into her pockets along with the book sales in the lobby. Squids and angels and mega heresy oh my! Time to release those warrior angels! Wonder twins activate! Shape of a discernment ministry! Beloved the key verses today come from a discussion about maturing in Christ. That maturity must be in the knowledge of Christ and that is only found in His Word. Not chasing silly false prophecies. We cannot attain the fullness of Christ without knowing His Word and using it to test everything. It is in this way we will not be tossed to and fro by the waves and carried about by every sneaky squid of doctrine. The Word will prevent us from being deceived by human cunning regaling us with mysterious stories about Santa Claus-like angelic beings. The infallible, incontrovertible Word of God will protect us from deceitful schemes trying to convince us that we can control other angelic beings. So we will no longer be as children, believing in the power of cartoon prophecies.